Legacy backup solutions are not adequate to meet today's data storage challenges, much less meeting tomorrow's. The best replacement solution will be one that not only addresses these issues, but also demonstrates significant cost savings, enables a rapid return on investment and ensures a seamless transition. 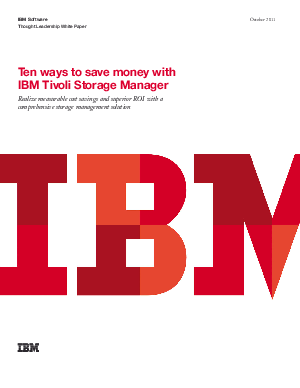 This white paper describes 10 ways that IBM® Tivoli® Storage Manager solutions can help organizations save money while addressing their data storage challenges, including those associated with exponential data growth.